I have to agree, because the man said what I’ve been saying for a week now: Michigan State looks like the best team in the country at this moment. Both teams in the Oregon-MSU game looked better than anything the SEC had to offer through the first two weeks of the season. Week three saw the Spartans struggle against Air Force’s triple-option offense, but, one has reason to expect, that data point will have little meaning going forward. Meanwhile, Georgia dominated South Carolina in what easily was the Dawgs’ best game of the year, and Ole Miss made it two straight over Alabama. The Black Bears’Rebels’ win certainly was exciting, and it’s led some to argue that they deserve the top AP spot. Their sixty-four points per game and undefeated record that includes a win in Tuscaloosa merit a top-tier ranking, but home wins over UT-Martin and Fresno State aren’t terribly revealing. Terribly revealing? Missouri’s ugly win over UCONN is a strong indication that the two-time SEC East champions are unlikely to defend their consecutive division titles in Atlanta this December. Ohio State had a similarly weak victory over Northern Illinois, but those Huskies are better than the ones from New England, and the Buckeyes’ recent track record suggests they’ll be fine going forward. Following a hot-knife-through-butter opening touchdown drive for the Oregon Ducks in last night’s national championship game, the Ohio State Buckeyes took over the game and never relinquished control. OSU running back Ezekiel Elliott averaged 6.8 yards per carry, and it felt like more than that in the second half, when Ohio State called the same counter run play seemingly on every down and repeatedly executed it successfully. Elliott was so hungry for more yards that he tried to eat confetti after the game. After that initial Oregon drive, the Buckeye defense, lead by coordinator and former OSU head coach Luke Fickell, found the answer, though, and Oregon’s bucket of tricks soon ran dry. Even in the second half, when Oregon’s defense produced a couple of turnovers, Marcus Mariota and the offense couldn’t make any progress. Oregon accumulated its twenty points with two touchdowns, that opening-drive score and a one-play, seventy-yard TD pass early in the third quarter, and two field goals. Those two field goals, along with a white-flag punt with eight minutes to go in the fourth quarter, felt uncharacteristic of a school that, in recent years, lead the charge of pedal-to-the-metal offense. With the College Football Playoff ©, we will have one thing we asked for and one thing we did not. A semifinal playoff round will precede, and determine the participants in, the national championship game. That is good, and it was a structural shortcoming of the BCS. For some reason, though, the College Football Playoff © scrapped the BCS’s rankings system in favor of a Byzantine (Soviet? Orwellian?) black box: the PolitburoSelection Committee. Participating in the BCS is like paying your income taxes: there’s a lot of math and fine print involved, you probably can’t quite find all of the information you need to calculate the precisely correct result, and there’s that guy down the block who hollers that the thing’s unconstitutional, but you generally have a pretty good idea of your expected outcome. On the other hand, the new playoff’s Selection Committee recalls the Supreme Court: members deliberate behind closed doors, apply any criteria of their choosing in reaching decisions, and announce those decisions under their own terms. 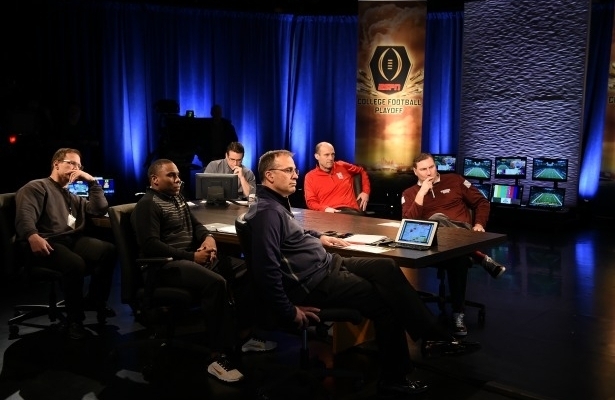 On Sunday, the Selection Committee spoke for the last time in its inaugural season to announce the four playoff participants: Alabama, Oregon, Florida State, and Ohio State. Two days later, everyone outside of Texas generally seems to agree that this is the right result. The only reason the results were or remain controversial has to do with what the Selection Committee did prior to Sunday. Their flipping and flopping of TCU, with seemingly connected treatments of Baylor and Minnesota, was the genesis of the confusion, surprise, and, in Fort Worth and Waco, disappointment, that arrived with the final playoff announcement. On one hand, those confused, surprised, and disappointed feelings were unwarranted: the Committee reached the correct result. On the other hand, however, they were unnecessary and likely would not have arisen absent the lack of transparency that now characterizes the college football ranking process. 1. Can Michigan State fix its leaky secondary? Saturday night’s Michigan State-Oregon game lived up to the hype, through the end of the first half, anyway. During the intermission, the Ducks figured out that the one, very real weakness of the Spartan defense was its secondary. Oregon quarterback Marcus Mariota was having no luck creating much of anything on his own, but if he could get the ball out of his hands, his receivers often were very open and had an easy time tacking on extra yards. Everything else seemed pretty good for Michigan State, and I’m not worried about how they’ll handle their conference schedule. At least against Oregon, though, the secondary looked like a real and easily exploitable problem. My question is whether this is a quick fix or a season-long problem. 2. How soon is too soon to fire Derek Mason? I have an extremely selective (read: poor) memory, but I don’t think Vanderbilt has had two games as bad as the two they’ve played this season in three or four years. A 37-7 loss to Temple and a 41-3 loss to Ole Miss pretty much says it all. USA Today called the latter “just total destruction.” Yes, the team lost its starting quarterback and a pretty good receiver named Jordan Matthews, but these guys look like they caught World Cup fever in the offseason and thought they were out for the soccer team. I don’t think David Williams should take the kneejerk reaction of firing head coach Derek Mason in Mason’s first year on the job, but Commodawg raised the question while we were watching the game, and the regression VU fans are seeing really is shocking. I think it’s okay to ask: If Vanderbilt continues to follow its current trajectory, would you consider firing Coach Mason in the 2014 calendar year? In easily the biggest matchup of the young college football season, Michigan State visits Oregon tonight. (6:30, FOX.) Both teams are very much in contention for a berth in the brand new College Football Playoff, and the outcome of this game figures to go a long way toward determining whether the Spartans or Ducks will find themselves in college football’s new final four. 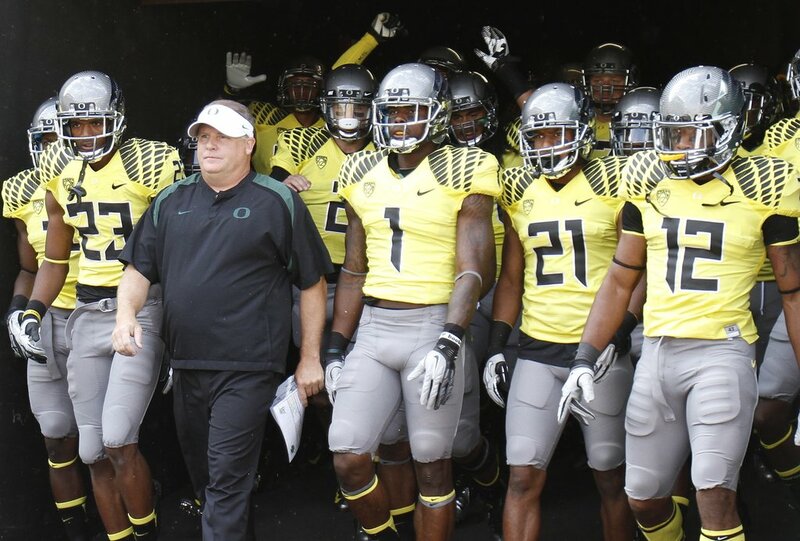 Despite their dynamic style, Oregon essentially is a known quantity, at least in broad terms. That doesn’t mean they’re easy to handle, and their junior quarterback, Marcus Mariota, is a strong Heisman contender. Due to some key graduations and departures (e.g., Darqueze Dennard), coupled with an added year of experience for the younger players, Michigan State figures to remain about as strong as last season, while trading a little defense for a little offense. He doesn’t pick MSU to win, of course, and Vegas has the visitors as twelve-point underdogs. 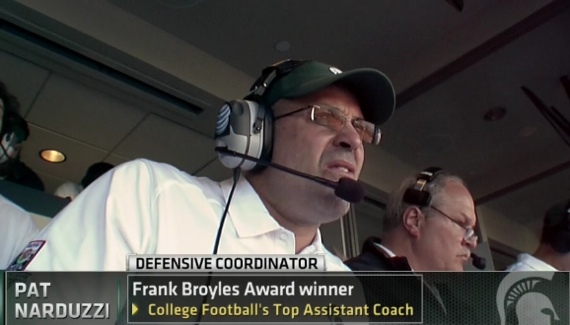 Michigan State is better than the Stanford team that ended Oregon’s undefeated run last year, though, and with Jacksonville State as their week-one opponent, Mark Dantonio, Pat Narduzzi, and everyone else in East Lansing has had all spring and summer to prepare for this one. You, on the other hand, have just a few hours to prepare for what should be a fun game. In the meantime, join Michael Weinreb, now apparently of SB Nation, for a very nice look back at the last time these two teams played each other.